Barack Obama and his team smashed all fundraising records on the way to victory, raking in a staggering $668 million. But some of that all-important cash came from questionable — even make-believe — sources. 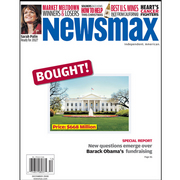 An intensive Newsmax investigation by investigative reporter Kenneth Timmerman — cited in a complaint by the Republican National Committee — uncovered numerous instances of questionable and even illegal donations. And, astoundingly, nearly half of his total campaign contributions, over $300 million, came from donors under $200 — donor names Obama still won't release for public scrutiny. 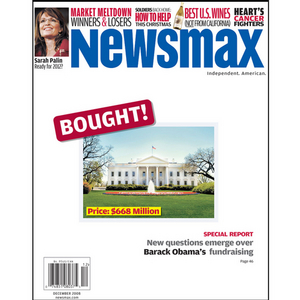 Newsmax magazine's special report "Funny Money: How Barack Obama Bought the White House for $668 Million" offers an in-depth look at the questions surrounding the fundraising efforts that have forever changed American politics. Over-the-limit contributions — were they really returned? Sarah Palin: The GOP's Next Ronald Reagan? Companies are bringing jobs back to the U.S.
Andrea Mitchell and Greenspan: Conflict of interest? Saudi: Mickey Mouse is "Satan's soldier"
George Soros: U.S. needs "new motor"